You are here: Home » Featured » Helping Young Families: The Church’s Job? Helping Young Families: The Church’s Job? This past month I’ve been thinking about the difficulties of raising young families. Conversations with friends and family and my own lived experiences have left me wondering how we are supposed to do all that is asked of us in raising a young family. No sleep, diapers, laundry, meals….it’s just crazy hard sometimes! After reading a recent article by Calah Alexander about her struggles to remain hopeful and faithful to Church teachings on family planning amidst the chaos of young family life, I was reminded that this is not an uncommon experience. That article was raw and honest and could’ve been written by me or any of my dozens of friends who are faithful Catholic mothers struggling in our often isolated world to raise our young families. I believe that the “Problem” that is silently present in Calah’s piece is a sense of abandonment. At our most trying times we feel as if we are alone with our chaos and that no one cares about us because what we are doing does not seem to concern anyone else.We don’t see our work as mothers raising good human beings as being valued. These feelings that many young mothers are experiencing result from several different circumstances in current society, but probably the largest contributing factor in my opinion has been a terrifying isolation that arises when we do not have the support network of immediate family readily available. We no longer have sisters right down the road or Mom across the street to watch the kids for a few hours so we can run out for groceries. No, instead we either have to load up the kids and bring them with through the store (and bear fifteen “My! You’ve got your hands full!” comments), or we hire a babysitter to come into our home who is likely a stranger. Very few mothers have situations that are more ideal. Without the benefit of family who are basically required to love and accept our children and help us raise them, we instead get used to staying in and only venturing out alone late at night to avoid the crowds. We become isolated and alone. We may even begin to dread going to Mass knowing that at some point we will certainly have to make a dramatic exit with one or more screaming toddlers. We become lonely and begin feeling abandoned by everyone; including God. Are these feelings justified? No. God never leaves us. But do we experience His presence and unconditional love through those around us, including our Church? Probably not as much as we need. Do we feel uplifted and respected for living our God-given call to motherhood when out in the world? Definitely not. We need a radical cultural change in order for mothers everywhere to no longer feel alone in raising children. There have been several articles written in response to Calah’s piece. Many call for the Church to step up and create mother’s ministries and groups within parishes to assist those in their fold who could really use some help. 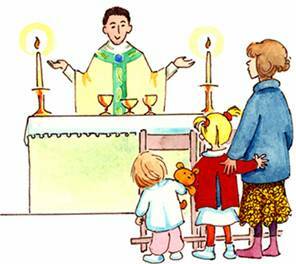 After all, the Church asks us to welcome children and be open to large families so it seems fitting that the Church step forward and provide some of the practical support that children demand. I agree completely that the Church can do more to help young families. Game nights, date nights, any sort of night with free childcare so Mom and Dad can breathe for two hours is truly a service for families. I actually have a personal story to interject here quickly that just witnesses how the Church (as in the People of God) can help keep us close to Her and the sacraments through just a little attention and support. My husband works 12 hour shifts and every third weekend he has to work. That means he is unable to attend the Saturday vigil Mass or the Sunday morning Mass (we don’t have any other options here). So every third Sunday I go to Mass alone, with five kids. I wake up early, feed, clean, and dress five young children in their Sunday best, load them into the mini-van, drive to Church and then try to herd them into a pew and keep them there for the next hour. It rarely goes well. Or at least it didn’t until a few months ago. A few months ago during a particularly conspicuous Mass which involved two kids pooping in their pants prior to the homily, a sweet older lady slipped into the end of my pew. She opened her purse and pulled out a pen and paper for my daughter who had previously been pinching her brother and pouting, but now became occupied with writing her name over and over again. “Why didn’t I think of that?” I wondered. She just stayed with me and helped to focus the kids on the Mass and keep them from fighting. At the end of Mass she gave me her card and said to call if I ever needed her to sit with us. She has sat with us every third Sunday since. She has even begun to print out Catholic coloring pages for the littlest two and has been wonderful about pointing the older ones to their missals and the altar. She has made Mass enjoyable again for me! She isn’t doing this on behalf of any group or as an official ministry of the Church; she is simply a woman who recognized the need of another mother and acted. And that is what I think is truly the only sort of response that will change our society into one that loves and accepts children and supports young mothers and families. Yes, I think the Church needs to act and reaffirm their teachings on family planning by providing some support and relief for the resulting large families and exhausted parents. But I do not think that will be enough to change the entire culture. Like I said earlier, we need a radical cultural change in order for mothers everywhere to no longer feel alone in raising children. It’s not just the Catholic mamas who are hurting and feeling isolated. We may have an added element of spiritual strife accepting our Church’s teachings at times, but really, most any mother will struggle to accept the sacrificial role they are called to in bearing children. There needs to be something outside of the Church as well that reaches out to mothers and gives them that company they need for the journey. I truly believe that is what The Guiding Star Project will become. The centers that we are working to create will focus on being a place where women in all stages of motherhood can come for support and respite. We all need a sweet lady to slip into our pew at times and just sit beside us and help us process the chaos. Or maybe it won’t be a pew for another mother but instead the ultrasound room, or the delivery room, or wherever she finds herself in need. Until we get our centers up and running (and even long after) do as another blogger suggests and just be present to others in need. Commit to being a sweet Guiding Star to someone in need. Recognize their requirements and step forward to help them. Shine Christ’s light on them through being present and taking away their loneliness. Together we can all light the way to a Culture of LIFE. This article originally appeared on Ignitum and is used with permission. Leah Jacobson, foundress of The Guiding Star Project, is dedicated to creating a Culture of Life through the implementation of Guiding Star Centers nationwide. These centers will promote New Feminism and Natural Law and are the next stage for the pro-women and pro-life movements to collaborate in a holistic, comprehensive approach. Embryo Adoption: Is it Okay?